Cycling is undergoing a surge of interest since the London bombings, as commuters decide to head to work under their own steam. Could they be avoiding the threat of terror only to face a more everyday danger on the roads? Two hours after the bombings on 7 July, a man walked into a bike shop in London Bridge. "He said 'I'm never going on the Tube again. 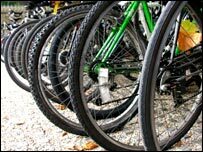 Sell me a bike,'" recalls Travis Lindhe, manager of On Your Bike, where sales have increased from three bikes a day to 15 ever since. A cyclists' organisation, the London Cycling Campaign, reports a 10 to 30% increase in use of bike stands at three points in central London, although it says this news is hardly a cause for celebration, given the circumstances. Fear has driven primary school teacher Stephen Thorpe, 45, on to the saddle of his new bike for his journey from Bow, east London, to Kennington. "You wake up in the morning and think 'I've got to get on the Tube and I'm taking a risk,'" says Mr Thorpe, who used to cycle part-time. "I was half an hour behind the Liverpool Street bomb, which was a very frightening experience. "But when I ride to work I don't have to worry about being a potential bomb victim." Traffic hazards are not such an issue because his route is on towpaths and quiet streets, he says. Nationally, there has been a small but steady fall in cycling over the past 20 years, with the capital bucking this trend. But the bomb attacks momentarily changed this. Birmingham City Cycles reported a surge in sales on 7 July, when it was also beset by transport and security problems. Not everyone is reacting through anxiety. Some of London's new breed of two-wheeled commuters say it's just to avoid the delays and disruption on public transport. Cycling was already enjoying a boom in the capital and this has accelerated that trend, says Barry Mason, of Southwark Cyclists. "The congestion charge increase, the obesity debate and then the long dry summer meant there were more and more cyclists on the road. Sadly the bombs have given it another kick." It's fast, healthy and no longer considered nerdy or for the super-fit, he says, so the novices should be welcomed. "There are fewer men in Lycra looking like Olympians and more people cycling in ordinary clothes, so people see them and say 'I can do that.'" The environmental benefits of this trend are diminished because it does not seem that motorists are switching from their cars to bikes. But for those new cyclists, there is an uncomfortable fact that they are far more likely to involved in an accident than in a bombing. But cycling is still very safe, says Mr Mason, because on average you would have to cycle non-stop for 96 years before you were killed. And the extra risk is offset by the health benefits. Yet this mismatch between perception and reality is significant and one of the main reasons for it is control, says Professor John Maule, an expert on risk and director of the Centre for Decision Research at Leeds University. "When people get on the Tube, they have no control of what's happening but when they're on their bike they feel more in control of their behaviour, so the perceived risks are reduced." Without the availability of statistics for us to work out the exact likelihood of being involved in an explosion, people do their own "mental short-cuts", he says. One factor is the availability of images in our mind, which dictates how soon the event could happen again. Pictures of the blast aftermath are so powerful and so omnipresent they stick in the memory, so people overestimate the likelihood of these events happening again. "How readily can you bring to mind the image of a cyclist being knocked down?" he says. "Not easily, because the media isn't interested and that's the lens through which we learn about the world." This principle applies to other areas such as child abductions, he says, which happen at the same rate as in 1945 but which are perceived to be more frequent nowadays, perhaps due to media coverage. Experiences which make you feel frightened increase your perception of risk, he adds, so getting on the Tube - and the associated anxiety - makes people think it to be more dangerous than it is. But it is perception that is the driving force behind people's decisions, and without official figures, anecdotal evidence suggests it's not just bikes which are in demand from ex-Tube travellers. Lorraine Duncan, 45, from Hayes in Middlesex, avoids the Tube on her daily commute to central London in favour of a bus from Paddington railway station. She accepts buses are now targets from terrorists but she feels safer above ground. "I'd rather be a live commuter than a dead hero. If I'm going to be a little inconvenienced, at least I'm alive." I've been riding a motorcycle to work for years. Over the last couple of weeks there has been a noticable increase in the number of cyclists on the roads. However, today it was back to normal. The reason? It's raining. It seems that people would rather face a cramped, smelly, uncomfortable, and perhaps dangerous, journey on public transport rather than get a little wet. I've cycled in London for about 5 years, am aware of the statistical risks and have had one accident that resulted in hospital. Yet, oddly, never think about the risk when cycling, but do now think about the much smaller risk on the tube - silly, but true! I cycle to work most days and there has been a notable increase in the number of cyclists on the roads since the first bombings. Today, however, in the pouring rain it was apparent that most of them had hopped back on the tube! I do hope it continues though - I maintain that cycling is the easiest way to get around London. What a shame that it takes the tragic events of 3 weeks ago to make people see all the positive benefits of 2 wheels. I took the decision to cycle the 3.5 miles to work everyday some 5 years ago and I wouldn't go back to driving (regardless of the weather, that's what high tech' waterproofs are for) if you paid me. The Bicycle was recently voted mans greatest invention, but I bet half the people who voted haven't riden one for years. I don't understand all this talk of 'Nerds' and Lycra, bikes are brilliant, they are the most enviromentally friendly form of transport available, they are free to use, cheap to buy.....and everytime I jump on mine it makes me feel like a little boy again!! I take my folding bike into London on the train and then cycle to my onward train at Waterloo. Not only do I integrate exercise in to my daily routine (I also cycle at each end of the journey), but it is the fastest way around town (Farringdon to Waterloo in 6 minutes; try that on the tube!). I never use the tube and am better for it. However can we get the rail companies to sell us point-to-point rail tickets that *don't* include the tube?? I've been cycling from Northeast London to work in Central London for years now and have noticed a lot of 'new' cyclists on the roads in recent weeks. They are easy to spot as they wobble their way with uncertainty through the morning traffic. It's just a shame that it's taken terrorist bombs to bring them out. Cycling has its risks, especially in winter, but I'd like to see more cyclists, and fewer vehicles, on London's roads in the morning, and I hope the 'newbies' don't all disappear after the summer. Although cycling seems 10 times more dangerous than driving, you have to remember that the figures are inflated by all the inexperienced people who cycle dangerously. You can make yourself much safer by taking a few simple precautions, like wearing high visibility clothing, being properly lit at night, staying well clear of HVGs, and being extra careful at junctions. In 30 years of daily urban cycling in four different UK cities, I've had just two bumps and zero injuries (touch wood). For me, the health benefits of cycling to work far outweigh the risks. Add to that the reliability and the sheer pleasure of cycling and it becomes the only sensible choice. I welcome the increasing number of fellow cyclists because the more of us there are, the safer it becomes. I applaud all the people buying bikes and cycling to work, it's fun and good for your health. But how many will continue to do it when the weather turns foul? It was only raining a little this morning and there were definately fewer cyclists on my way to work. I have cycled on and off for many years in London and have seen a sharp increase in cyclists in London since the bombings - many of them inexperienced and unconfident. I hope that the Government looks at this increase of cyclists and does something to better the services available to us. I also hope that they amend legislation to make helmets and reflective wear compusory. Until then, new cyclists on the road must be made aware that sensible riding, the proper gear and a respect for the rules of the road will help them and other cyclists like myself safe! Can we have a campaign for better cycle route marking - particularly at junctions. I've just come back from a cycling holiday in Belgium where most roundabouts have a clearly marked cycle track at the outside edge of the road - with give way lines for cars to give way to bikes. Here it seems that cycle lanes end just before junctions with an "End of cycle lane" sign - leaving you in limbo just as the traffic gets complicated... a recipe for more of those cycling accidents. Did you also know that analysis of the statistics shows that the more people cycle, the safer it becomes on the roads. This is generally due to the increased acceptance of road users that they need to be aware of cyclists on the road.